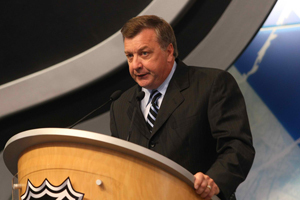 The Pittsburgh Penguins have hired former long-time Atlanta Thrashers general manager Don Waddell as a professional scout, it was announced today by executive vice president and general manager Ray Shero. Waddell, 53, was recently the head coach of the United States’ entry at the 2011 Deutschland Cup in November, an international tournament hosted by the German Ice Hockey Federation. Penguins player development coach Bill Guerin served as one of his assistant coaches. A native of Detroit, Mich., Waddell was the Atlanta Thrashers general manager from the team’s inception in 1999-2000 through the 2009-10 campaign. Waddell was promoted to President of the Thrashers prior to the ’10-11 season, but elected not to stay with the franchise when it relocated to Winnipeg last summer. During his time in Atlanta, Waddell twice served as interim head coach – first during the middle of the ’02-03 season and then for the majority of the ’07-08 campaign. In 86 games as coach, Waddell posted a 38-39-1 record. Throughout his career, Waddell has been heavily involved with USA Hockey, where he has developed a close relationship with Penguins general manager Ray Shero. Both Waddell and Shero were members of the four-man advisory team that selected the 2010 U.S. Olympic Team which earned a silver medal at the Vancouver Games. Waddell has helped Team USA in a variety of other capacities throughout the years, including general manager of the 2006 Olympic Team that competed in Torino; general manager for three World Championship entries (’05, ’02, ’01); a two-time World Championship assistant GM (’04, ’00); and assistant GM of the 2004 World Cup team. A seventh-round (111th overall) draft pick of the Los Angeles Kings in the 1978 NHL Draft, Waddell played one NHL game with the Kings during the 1980-81 season. Waddell, who graduated from Northern Michigan University, was a standout performer as a player in the IHL, winning First-Team All-Star honors in ’82 and ’86, Second-Team honors in ’88 and the Governors’ Trophy as the league’s ‘Outstanding Defenseman’ in ’82.